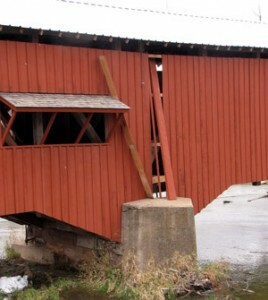 Someone kicked a few boards off the covered bridge so they could grab the Christmas wreath. It was 8 ft. tall. Since we have restored the mill dam and mill pond the only way to get to the wreath was from the inside. Fortunately the boards didn’t fall into the creek. The county was able to fix it. I have contacted the media … 2 newspapers and 2 TV stations. I have heard other newspapers and TV stations have picked up the story. Hopefully someone will see the wreath. I think an 8 ft. Christmas wreath is easy to see. Did you ever find the wreath stolen from the Bridgeton Bridge? Are there plans to have a new one for next year? I have not heard anything from the sheriff. Yes, there is talk of getting a new one. A local family has offered to pay for a camera system for the bridge. But, I haven’t heard any more about it. I’m not in the politics anymore.